Simple houseboat plans to start building your own houseboats. Houseboat plans to get planning and building. The houseboat plans section is constantly expanding, so in order to get a good overview, I've included these to show the design possibilities. You're building a house boat, and only limited by your imagination and budget. * Once you have decided to build a boat, you will be needing some building materials, marine parts, and technical building information . You will find different houseboat models that are available, and that can be built by someone who is handy with tools and have the space for construction. Click an image/plan below to go directly to it. You're building a house boat and curious about house boat construction? 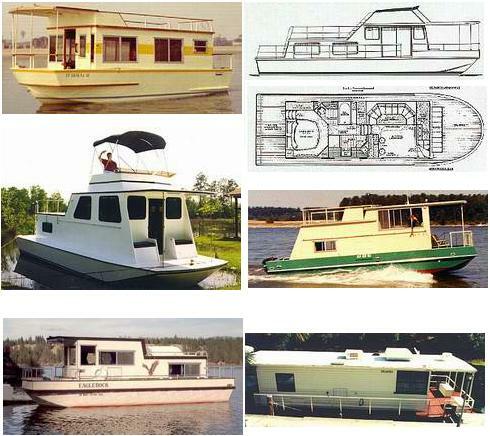 Here you'll find house boat design and floor plans for pontoon, trailerable, catamaran, or full hull models. A variety of the plans can be built in either wood, fiberglass, aluminum and steel. Most have "study prints" available to give you an overview, and there's even some pontoon house boat kits available to help speed things up. 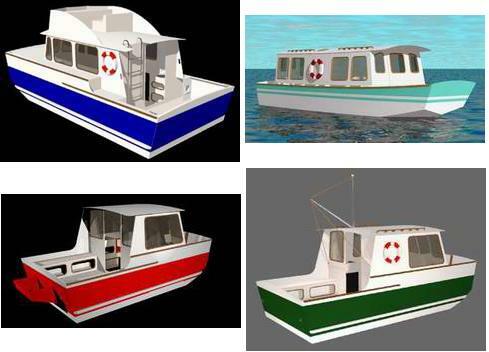 See these houseboat plans here. Try to document & photograph you're project. Help others by letting us know. 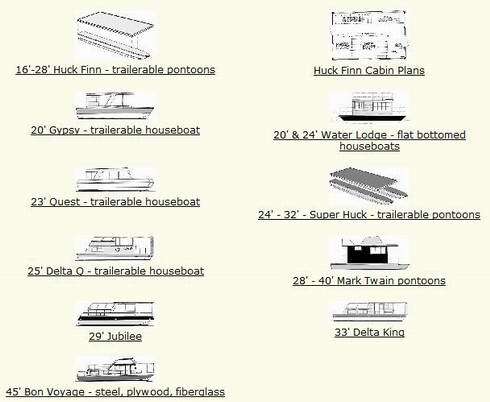 You're building a house boat and curious about houseboat construction? Here you'll find house boat design and floor plans for pontoon, trailerable, catamaran, or full hull models. A variety of the plans can be built in either wood, fiberglass, aluminum and steel. The Houseboat Plans section is constantly growing, so it's best to stay updated and signup for our Houseboat Insider magazine, it's free, informative, shows the updates, and is sent directly to your Inbox.